Another beautiful design by Patti Waters. The Swarly hat features a swirl pattern which is created by using two colors of Ivy Brambles Superwash Worsted yarn. Very warm, and very fun, why make a boring hat when you can create a Swarly hat! Sample is shown in Colorway Night Sky and Grand Canyon. Ivy Brambles Superwash Worsted Yarn #105 Corn SilkIvy Brambles Superwash Worsted Yarn is a deliciously soft hand dyed worsted weight yarn that is machine washable (cool) and dryable (low heat) designed for sweaters, baby garments and accessories desiring a worsted yarn. This is truly a spectacular yarn! Ivy Brambles Swarly Hat Pattern by Patti Waters Another beautiful design by Patti Waters. 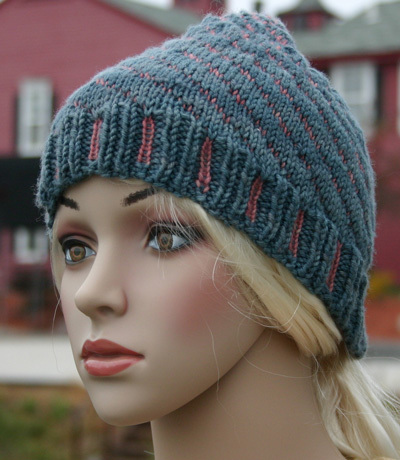 The Swarly hat features a swirl pattern which is created by using two colors of Ivy Brambles Superwash Worsted yarn.